I ended my last blog with: “I’ll probably blog again when I’m back from Barcelona unless I win one of the WCOOPs.” Well that almost happened! I didn’t play a lot of WCOOP’s because of my trip to Barcelona but I did play Event #20: $215 Fixed Limit and finished 11th. During my deep run in the Sunday Million I was pretty nervous and wasn’t really that confident that I was one of the better players, during this event I wasn’t nervous at all and was really confident that I would reach the final table. When we arrived at the last 2 tables there were some good players left but after Debilne_Ucho busted in 13th place the only good player remaining was djk123. I’m not sure how often he plays Limit but at least I considered him as the best player left. I was really card dead for a long period and when finally catching a good hand (AdQc) I got it all in on a 4d,5s,7d,2s board vs As9h and was 3 outered (4 outs for a split) on the river. 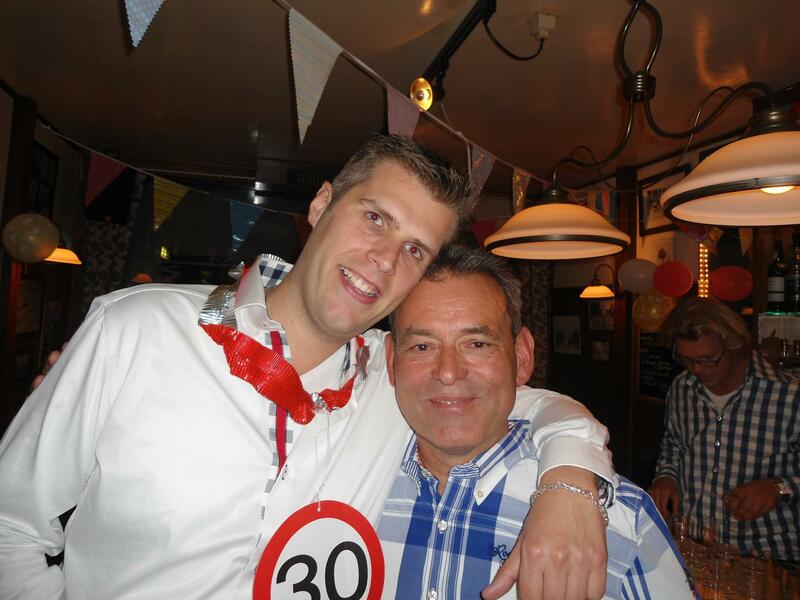 The 15th of September I celebrated my 30th birthday and what a great party it was. 60/70 friends, lots of presents, alcohol and good music. It’s great to have all the people you care about in one place at the same time. Such a great and happy bunch and sometimes you wish you could freeze time! Some of my friends are already married and/or have children but most of them are not that far yet, I really wonder how my birthday party will look like in 5 years time and obviously how my own life looks like. Hopefully I’m as happy and healthy as now, 30 isn’t that old after all! 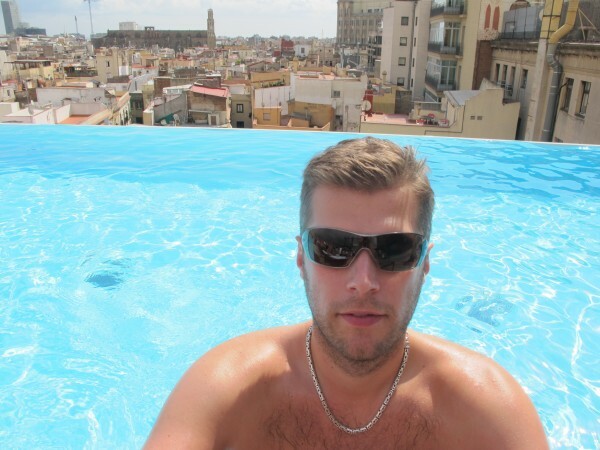 So after my birthday party it was time for a week in Barcelona. It started pretty good when we arrived at our hotel. The hotel was in the old city center but from the inside really modern and had a great vibe. The reason for picking this hotel was the rooftop infinity pool, we’ve used it every day to relax after walking around this great city. Lots of cava, great sushi, tapas and sunshine of course. My girlfriend gave me a great birthday present, tickets for Barcelona – Spartak Moscow. Like a real tourist I bought a Messi Barcelona shirt and seeing Barcelona play in Camp Nou was magnificent! I hope to be back soon again, maybe for the next EPT? Since my return from Barcelona I’ve been very busy with poker again! LHE cashgames have become really hard lately, there are less tables at each stake and there are hardly any High/Mid-Stake games running. Now I don’t even want to play High Stakes games but since the players who do can’t play High Stakes they move down a bit so this makes the Mid Stakes games harder. 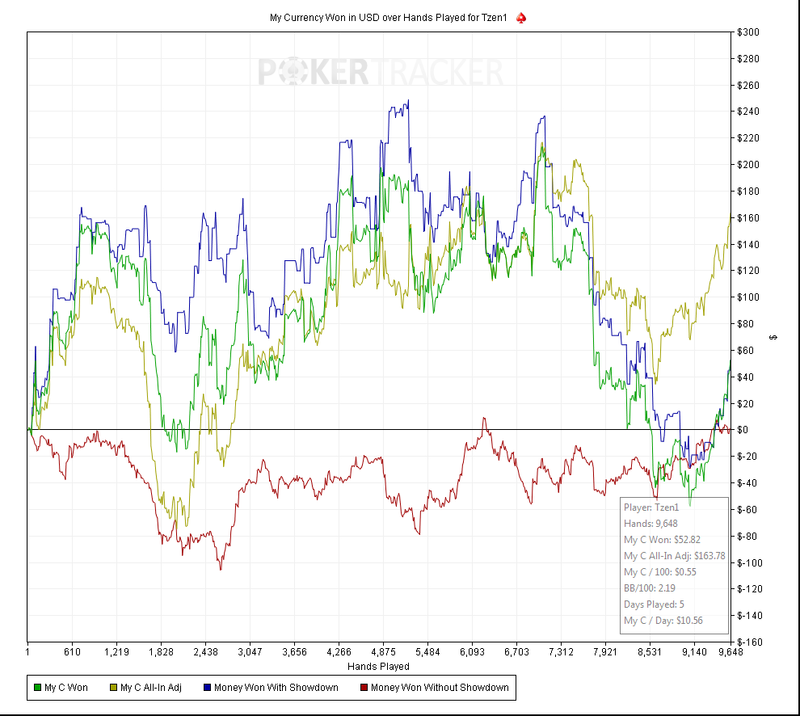 Some Mid-Stake grinders then move down to avoid the better players and then those games become harder as well. This happens at every stake and the result is that all the games become harder which is bad for everybody. This has been going on for some time now and it’s not like the games are completely unbeatable but I was kind of done fighting the same regs over and over. Some regs moved to other games and I was wondering if I shouldn’t do the same. I’ve been thinking about playing more MTTs because of my deep runs as of late but in general I wanted to improve my NL game. To do this I decided to grind some ZOOM 25NL, mainly because I also really love ZOOM. The fast pace and the fact you can play a lot of hands/hr while never playing more than 4 hands at the same time is great. I have a pretty good idea of people’s ranges in tournaments but had never really put in a decent sample in NL Cashgames. The biggest different is of course that you almost always play more blinds then in a MTT and it took me some time to adjust to this. I couldn’t believe how tight people were in these low stakes ZOOM games. Nobody was ever bluffing, at least that was what I experienced in 20.000 hands of ZOOM. You probably don’t have to bluff to win at the lower stakes but I really was shocked how tight these games played. I really missed the reckless fish in these games and because of the fact you play a lot of different players in ZOOM games, it took a long time before I really figured out it played out this tight. I took notes on people but since I hardly played against the same people and had little stats to base my decisions on I called off way to light in a lot of cases. Since I’m used to play with a lot of stats available I figured out that regular cash tables were probably better for me then ZOOM and this proved to be true. I can’t call myself a real NL shark yet but I’m up on the normal tables (of course running below EV 🙂 ) and have been working on my non showdown winnings. The sample is really small still but I’m planning to keep playing some more NL cash just to get the hang of it. The idea still is to play more MTTs and I’ll probably try to get in a good sample during the last two months of this year. I enjoyed putting effort to get better in poker again but I can’t say I really enjoy playing NL Cashgames. Because of the very nitty nature of the game I think LHE is way more fun. You can play more hands, there is more action postflop and I really missed the LHE cashgames these last weeks. I want to use to remainder of the year to freebee a bit between games and might decide to go back to LHE or maybe even move to PLO, who knows? I did sign up with Leggopoker and so far I’ve enjoyed watching a couple of videos. I think they offer great NL and MTT videos and I think it could really help me in my overall NL game which I never really gave any attention at all. On the 24th of November I’ll attend the Open Pokerdag 2012 in Utrecht. Within 3 days this event already reached the cap of 200 players and after upping the cap to 240 it was sold out a day later and now even has a waiting list of 40 people! I think it’s really going to be fun to hang out with 240 poker minded people and since a lot of people know each other via the online communities I expect a lot of trashtalking and drinking. On the 1st of December there is another event which I will attend but I’m not sure what I can say about it at this stage but I’ll probably write something about it in my next blog. I’m really eager to play poker but unfortunately I have a really busy schedule apart from playing poker and of course my day-job. Luckily these other things are almost always fun things so my life ain’t that bad 😉 Fellow TeamOnline DaWarsaw(Greg) visited Amsterdam for 3 days last week and I helped him out hosting a Poker Tournament for 80 Polish bankers in Amsterdam. I was shocked how bad 80 high educated people were at playing poker but it also reminded me at how the early days of poker actually looked liked. I was probably as bad as these players when I started out but I also remember the beginning of the poker boom when I already had some experience but most other players really didn’t have a clue what they were doing. I wish…. This weekend I also finished a sports bet with a friend of mine. In Las Vegas we talked a bit about doing a sports bet and although I don’t consider myself to be great at sports I did think I had a good chance of winning this bet. We agreed we would battle in cycling, tennis and table tennis and the fun part was that we had never played with or against each other so we had no clue how good the other one actually was. I considered myself favorite in cycling an table tennis so hoped to win the bet. 3 weeks ago we started out with cycling and to my suprise he beat me by more then 1,5 minute! Currently he participates in another great PokerStars Promo called the All-Star Showdown in which he already won his first match against Kanu7 and can win more than $500.000! He might be able to find some time in his agenda to join next week’s Team Online Freerolls which are every 1st Sunday of the month. Click on the banner below to see how you can play these freerolls! I think this blog contains plenty of content again and I’ll hope to give an update after the MCOP bragging about a final table or even a victory. See you at the Master Classics or Online!